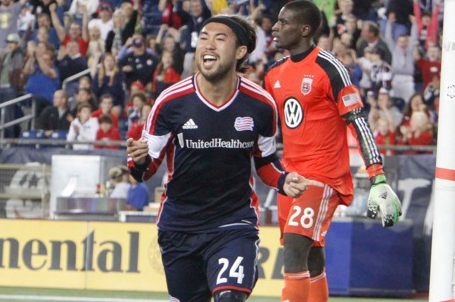 The New England Revolution will bid to keep their winning streak alive when they welcome D.C. United to Gillette Stadium on Saturday for the second and final fixture between the two Eastern Conference rivals for the 2014 campaign. Kickoff is set for 7: 30 pm. The Revs extended their winning streak to four matches following a 5-3 thriller at PPL Park last weekend. Five different players netted a goal for New England against the Union, while three were able to contribute a goal and an assist to propel the Revs at the top of the Eastern Conference table. Last week’s victory, which was the club’s first victory at PPL Park, also extended New England’s undefeated streak to six games (5-0-1). In that stretch, Jay Heaps’ squad has found the net 17 times while limiting its opponents to only 6 goals. Coincidentally, New England’s last losing effort came back in April 5 in the nation’s capital against D.C United, who currently sits right after New England in the Conference rankings with 18 points. DC United is coming off an impressive midweek 2-0 victory at the RFK Stadium over the Houston Dynamo. Goals from Fabian Espindola and Chris Rolfe were enough to clinch the deal for DC in a rain-soaked contest on Wednesday night. The 2-0 victory over the Dynamo extends the Black-and-Red’s unbeaten run to three matches. New England starting goalkeeper Bobby Shuttleworth was held out with a concussion on Saturday in favor of Brad Knighton and could return to the lineup, while rookie Patrick Mullins – who scored three goals in as many matches – looks likely to lead the attack once again. Captain Jose Goncalves could return for the hosts after missing the last five games with a right quad injury, but may have to fight his way back into the line-up with the defense’s recent strong performances. The 2013 MLS defender of the year picked up the injury on April 12 against Houston. For the visitors, US international forward Eddie Johnson will return after serving a one game suspension handed by the MLS Disciplinary Committee for a reckless play last Saturday against the Impact. In the last contest between the two sides, the Black-and-Red secured a 2-0 victory to halt a 16 game winless streak in league action. Goncalves scored an own goal just before the half to give the hosts the lead, and Chris Rolfe doubled the lead in stoppage time with a strike. D.C. leads the all-time regular season series between the two sides, 29-25-9; However, the Revs hold a 16-10-5 advantage at home against D.C. While the Revs have managed to score 10 goals in the past two games, D.C. has only allowed one goal in its last three outings. It will be interesting to see if New England can keep up the pace against one of the better defensive units in the league.